In April of this year Julio Cesar Chavez Jr. suffered only his second loss in his fifty-one fight professional career in losing to top Light-Heavyweight contender Andrzej Fonfara. The loss for Chavez was also the first time he was stopped in his professional career as Fonfara dominated him throughout much of the fight including knocking Chavez down in the ninth round. Although Chavez was able to get up from the knockdown, he quit on his stool at the conclusion of that round. A question that some fighters will have to answer over the course of their careers is how they will respond to their first knockout loss. Even though in Chavez’ case the knockout was a technicality, the fact that he was unable or wouldn’t finish his fight against Fonfara may have some questioning what kind of psychological effect that fight had on him. After all, Chavez is known as “The Son of the Legend” and has been tasked with carrying on the legacy of his father the legendary Julio Cesar Chavez Sr. For Chavez, Jr. he was thrust into the spotlight immediately upon beginning his professional career. To his credit, Chavez has been able to garner a significant following of his own and has had a fine career in his own right including winning a world title in the Middleweight division along the way. Chavez however, has been questioned about his overall dedication to the sport throughout his career and in addition to suffering losses to Sergio Martinez and Andrzej Fonfara has had weight problems throughout his career as well. When a fighter suffers a knockout loss another question that some might ask in addition to what effects will it have on that fighter going forward is will the fighter attempt to come back from that loss too soon. Now nearly three months after the loss to Fonfara both of those questions will be answered as Chavez prepares to return to the ring against relative unknown contender Marcos Reyes on Saturday night at the Don Haskins Center in El Paso, Texas. In my post-fight coverage of Chavez’ loss to Fonfara this observer stated while discussing Chavez’ potential options coming out of that fight that Chavez, who was fighting for the first time as a 175 lb. Light-Heavyweight could for his next fight move back down in weight to the 168lb. Super-Middleweight division. Chavez will indeed be moving down in weight for this fight. 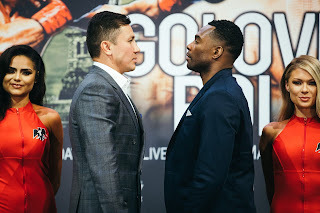 Although this is officially a Super- Middleweight bout, Chavez came in nearly three pounds over the Super-Middleweight limit weighing in at 170.8lbs at the weigh-in on Friday. Despite coming in overweight, an agreement was reached between both camps allowing the fight to go on as scheduled. The key to this fight in my eyes will be which Chavez shows up. There have been times throughout Julio Cesar Chavez Jr’s career where he has looked spectacular in his performances, most notably against fighters such as Andy Lee and in his second fight against Matt Vanda. Chavez however, has also had periods throughout his career where he has not looked impressive, most notably in his first fight with Matt Vanda and his first fight against Brian Vera. In both bouts Chavez was able to score a victory over both fighters in bouts that went the distance, but many observers, this one included felt that the decisions in those fights should have gone the other way. One might argue following a one-sided loss at the hands of Andrzej Fonfara back in April that Chavez’ status as a marquee attraction may be at stake in this fight. In Marcos Reyes, Chavez faces a veteran of thirty-five professional fights comes into this fight as he underdog. Reyes, who weighed in at 168.4lbs. at the weigh-in on Friday enters this fight with Chavez with a record of 33-2, with 24 Knockouts. Reyes however, has not fought many notable fighters throughout his career and this fight is clearly the biggest of his career. Reyes will be fighting for the second time since dropping a ten round majority decision to Middleweight contender Abraham Han in October of last year. In his last fight in January of this year Reyes scored an eight round unanimous decision over David Lopez. Although this would have the appearance to be a “Comeback Fight” for Chavez, who will enter the fight with a record of 48-2-1, with 32 Knockouts, it is important to keep in mind that Reyes has never been stopped in his career and if Chavez is not in 100% Reyes could have an advantage in this ten round fight if it goes into the later rounds. Reyes must set the tempo from the outset. Andrzej Fonfara was able to have great success against Chavez by utilizing a high defensive guard, lateral movement, combination punching, and counter punching. Chavez often led in with his head which allowed Fonfara to take advantage of openings that Chavez would leave due to his defensive flaws. It will be interesting to see if Reyes will look to implement part of Fonfara’s strategy in this fight. For Chavez he must not walk straight in and lead in with his head like he did against Fonfara. Two noticeable things that were absent for Chavez in that fight were head movement and the use of a consistent jab. Chavez must establish his jab early in this fight and keep it consistent throughout. Although I expect Chavez to attempt to cut the ring off from Reyes, he needs to move his head as he presses forward or he will risk leaving himself open to being countered as was the case when he fought Fonfara. In terms of what this fight could mean for the Super-Middleweight division one should keep in mind that despite his loss to Fonfara in the Light-Heavyweight division, Chavez is currently rated number five in the world by the WBC and number ten in the world by the WBA in each respective sanctioning organization’s Super-Middleweight ratings. A victory for Chavez could lead to lucrative opportunities down the road especially in light of the recent retirement of longtime Super-Middleweight champion Carl Froch. A loss however, one might argue could put his career in serious jeopardy. For Marcos Reyes this is an opportunity to establish himself against one of the stars of the sport. Whether or not Chavez’ status as a star in the sport is beginning to fade is a question that could well be answered on Saturday night.